Byzantium and the Silk Trade: Byzantium was one of the most important western terminals of the Silk Road. Constantinople, the capital, stood at the crossroads of Europe and Asia where many sea and overland trade routes linked the two regions. Its value as a commercial center for the export of silks into Medieval Europe was enormous. At first, the Byzantine Empires main article of trade was Chinese silk, which was so scarce that it was coveted by westerners even more than spices or jewels. Even within the empire the wearing of silk was limited; under Justinians rule (518-527 CE) court ladies who were entitled to wear silk could do so only if they purchased it in the Crowns sale rooms situated in the Great Palace. The introduction of the silk worm into Byzantium, about the time of Justinian, expanded the empires domestic silk possibilities. Although Chinese silk continued to be imported, silk worms were raised throughout the empire, with the cocoons transported to Constantinople for spinning and weaving into cloth. Empress Irene and the Silk Trade (752-803 CE). Called Irene of Athens in honor of her birthplace, Irene is mainly remembered for two dramatic events. One is her role in helping restore the use of Christian icons or images in Byzantium, which had been forbidden in the Eastern Orthodox form of Christianity. The other is her retaking of the crown from her son Constantine, blinding him, and possibly causing his death. Given these sensational events, it is no wonder that few have acknowledged Irenes role in promoting and expanding the silk industry in this western terminus of the Silk Route. Like all noble women and men, Irene loved silk textiles, both to wear and to adorn sacred objects and church decorations. The finest of her silk clothes was noted for the first time when she arrived in Constantinople from Athens for her marriage in 769 to the Byzantine Emperor Leo IV. Leo died when their only son, Constantine, was nine years old, leaving Irene as mother-regent and co-ruler with the young boy. After various conspiracies, she was forced into exile, only to be recalled after seven years when her unreliable and weak son was deemed unfit to rule. This time she was given complete control of all state services, including the fighting forces. Even though she rarely appeared in public, Irene ruled in her own name, while also adopting for the first time the male title of basileus on legal documents. She had a new gold solidus (coin) minted that represented her as empress, and began a close relationship with the Carolingian dynasty and Roman papacy, hoping to have herself crowned as a Roman Emperor. It is said that at one time she wished to marry Charlemagne. Pope Leo III, however, announced that the throne of the Byzantine emperor was vacant since Irene was a female, leaving the way from him to crown Charlemagne as Roman Emperor in 800. Irene saw the enormous economic value of the Byzantine silk production. Like China in the past, she remained determined to keep its control firmly within the Byzantine sphere by creating large imperial controlled industries. To support these industries, Irene built a new palace called the Eleutherios located in the center of the city near the commercial port. The silk-weaving shops built around it were tightly monitored by the state with imperial guilds in charge of them. While both male and females were employed in the workshops, called gynaecea, they were mostly staffed by women whose lives were strictly regulated. To avoid the danger of skilled workers being kidnapped by rival nations, the workers were not allowed to leave. Some describe them as being held as virtual prisoners. Further, though the silk trade generated large amounts of money, little made its way into the pockets of the workers. The value of women silk workers in Byzantium was, however, acknowledged in the years following Irene. Tales of Byzantine workers being kidnapped exist, the most famous being that of the women silk weavers whom the Normans carried off as booty when they sacked the Greek city of Thebes in 1147. And, Carolyn Connor in her book Women in Byzantium: Varieties of Experience 800-1200, describes a festival from the eleventh century held every year in Constantinople which celebrated women engaged in cloth making and the female guilds.  Why was Byzantium ideally placed to be the terminus of Silk Road trade?  In what ways can you connect the making of silk to women in Byzantium?  What was the point of forbidding silk workers to leave their place of employment? Do you think it might have been easier or not to restrict the mobility of women workers than men workers? 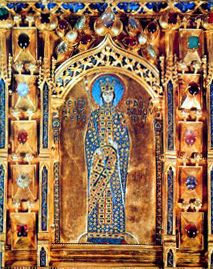 1) Irene on one Pala dOro panel Find other famous Byzantiums here as well. This was suppose to have been sent from Byzantium to Charlemagne from imperial workshop: The images on it show influence of several cultures, including Byzantine and Indian.